In Playtech Pontoon, all the cards have the usual values. Dealer gets 2 face down cards, checks for pontoon, then keeps his cards face down until the player stands or busts. The winning hands, however, are a bit different. The best hand is Pontoon (essentially blackjack). The second best is a Five Card Trick – this is a hand with 5 cards that has not gone bust, no matter what the total value of the cards is. Next comes a standard hand with a total of 21, then all other hands follow. The dealer, however, wins all ties. The dealer hits on soft 17 and stands on hard 17. The player has a rule to – you must hit on anything below 15! You can split any pair, and a ten card dealt onto split aces actually counts as Pontoon in this game. There is no option for insurance, and you cannot surrender. In the end, this game is much like standard Blackjack, with a few differences. In Playtech Pontoon, your bet must be between 1 and 300 USD/GBP/Euro. You place your bet using any combination of the 7 chip sizes offered in the game. Winning hands – Pontoon and Five Card Trick – both pay out at 2:1. If you win with a hand totaling 21 or less using 4 cards or less, you get paid out at 1:1. Insurance is not available, so these are the only payouts in Playtech Pontoon. 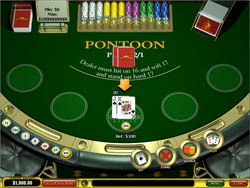 Graphically, Playtech Pontoon is definitely one of the best blackjack games out there. Everything from the table to the cards to the chips are rendered with fine realism, and looking at the scene you’d almost think it were a photograph! The cards and chips are subtly animated, but everything works fast and smooth even on older computers, so there is nothing here to slow things down. The game plays well too, and it seems the designers spent a lot of time thinking about how the game would be played, because it’s basically flawless! When you first load up Playtech Pontoon, it will just look like a really beautiful blackjack game. But once you start to play it, the subtle differences will show. Pontoon is a great game, and the rule changes make for some really exciting gameplay. If you know and love Pontoon, definitely look into this version, because it’s quite amazing. If you’re new to Pontoon – well, what are you waiting for?